Three individuals, one nonprofit organization and an entire Marine helicopter squadron were honored Wednesday for their contributions to San Diego’s military community. 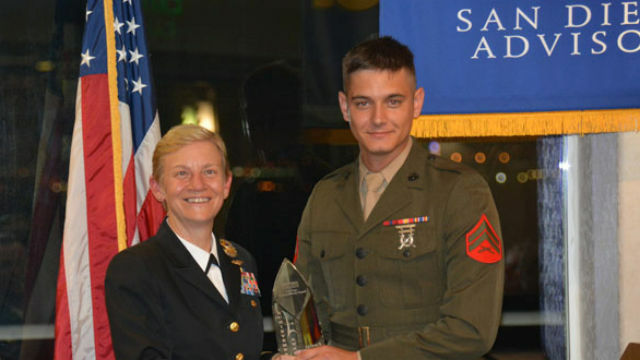 The San Diego Military Advisory Council‘s 9th annual achievement awards recognized local civilians, military personnel, companies, and organizations that have volunteered thousands of hours. Nancy Dix, a founding member and former SDMAC president, received the Rear Admiral Bruce Boland Lifetime Achievement Award. Dix, a partner in the law firm of DLA Piper, has devoted 25 years of public service to the San Diego military community. Helicopter Sea Combat Squadron Two Three, whose members volunteered nearly 2,400 hours of their time to helping children, seniors and the environment. Veterinarian Craig J. Mohnacky for his the ‘Helping Paws’ program for the pets of active-duty military and their families. Marine Cpl. Devon M. Hulteen for volunteering 50 weeks each year with ‘Operation Bigs’ as part of the Big Brothers and Big Sisters in addition other volunteer activities. The Pegasus Rising Project, a non-profit organization that supports military personal and veterans through its unique Equine Assisted Experiential Health Therapy program. SDMAC encourages a partnership among San Diego’s military, business and public leaders to promote the region’s $40 billion defense sector.